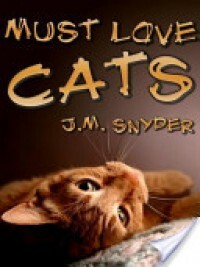 With “Must Love Cats” J.M. Snyder introduces us Dale, a thirty-one year old food critic, somewhat hypochondriac, with no love for dogs, cats or any kind of animal. Having also some high standards he can’t seem to find a man good enough for him to have a relationship with. So beside his BFF bisexual friend Jill he is a pretty lonely man. That loneliness shatters though when a cat shows up at his door and into his house as if it belonged there. All in all a very amusing story with funny incidents, sensual daydreams and likable characters I would recommend it to those who like fantasy and humorous romance.